Preheat your oven to 350 degrees, and lightly grease a 9-inch round fluted tart pan with removable bottom. The easiest way to make the crust is in a food processor, but if you don’t have one, you can also make it by hand. Just combine both flours and salt in a large bowl, and add in the oil. Mix well, and then drizzle in water until it comes together in a cohesive dough. Otherwise, you can simply toss everything in the food processor, and drizzle in water until it comes together in a cohesive dough. One method saves you time and the other saves you dirty dishes to wash later, so pick your poison. Move the dough into your prepared tart pan, and use your fingertips to press it evenly into the bottom and up the sides. If it seems sticky, lightly moisten your hands to make it easier to handle. Bake for about 10 – 15 minutes, just to help it set up a bit and very, very lightly brown. Let cool. Toss your chopped veggies, scallions, and minced garlic together to achieve and even distribution of everything, and then transfer it into your par-baked crust. You want to just about fill the pan with veggies. In a separate bowl, whisk together the chickpea/garbanzo flour, potato starch, nooch, salt, herbs, spices, and baking powder. Pour in the vegetable stock or water and oil, and whisk until smooth. It should be about the consistency of pancake batter. 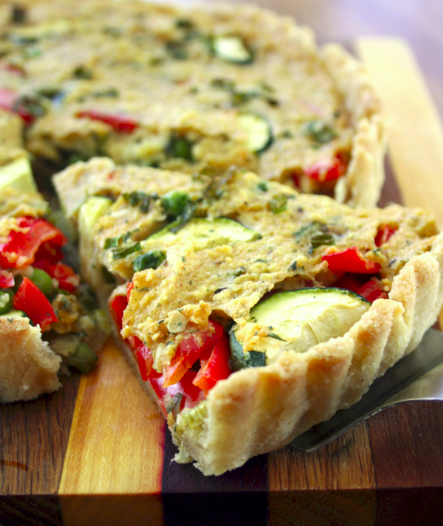 Pour this batter on top of your veggies situated in the quiche pan, making sure to fill all of the gaps. Lightly tap the pan on the counter a few times to release any air bubbles. Bake for 45 – 55 minutes, until the filling appears set and every so lightly golden brown on top. Let cool for at least 15 minutes before slicing.